You will receive a notification from ebay when your item ships along with the tracking number. It can also be found online on eBay at any time. Once in your eBay account, click on "My eBay" in the upper right corner. Click "Purchase History" from the drop down menu. Find your item from the list and click on "View Order Details". You may also contact us and we will resend the information. Can you make custom sizes or designs? Can you ship to a different address than my own? If you need to ship to a different address than your usual home address, please be sure to change the address when you are processing your payment in paypal. During the checkout process, one of the screens will show your address. Click on Edit Address and enter the address you would like us to ship the package to. It is very important that you change the address in PayPal if you would like your package to go to an alternate address. Do you have more quantities than shown in the listing? If you would like to purchase additional pieces, just let us know. We will most likely have more in stock than are showing in the listing. All of our shipments are fully insured. In the rare event that an item is damaged in transit, please ase Contact us directly contact us immediately and we will send a replacement. Please do not file an "item not as described" or as an eBay "Return Request" for damaged shipments. Do your window panels have hanging hardware? Yes. All of our panels come with hooks or chains, ready for hanging. Do the hanging lamps need to be hard wired or is it possible to have it a plug-in version? Many of the lamps that are usually hard wired can be converted to a plug in type lamp by purchasing a conversion kit at any hardware store. Do you have matching designs? Yes we do! 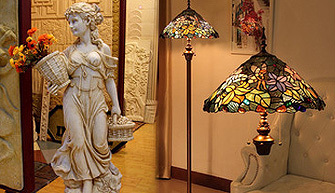 Many of our lamp designs having a matching table lamp, hanging lamp, wall sconces, and floor lamp. Contact us and we will send you links to the matching products. Will the item I receive look exactly like the photo? T​he handcrafted nature of many of our products create variations in color, size and design. There will be slight variations in finish, color and texture. These variations are a reflection of the authenticity of the piece and signal the originality of the artisan. Since each piece is hand-crafted, yours will be truly unique and will vary slightly from the one pictured. What can I do if the item I want is showing as out of stock? Sometimes an item may be out of stock temporarily, feel free to contact us about a specific item and we will contact you when it is back in stock. Absolutely. We combine shipping whenever possible. We offer approximately a 40-50% shipping discount on each additional item purchased that can be shipped together. Please email us when you are done shopping and we will send you a combined total. If you want to check out separately that is fine, we will refund the difference. ​​​​Do you ship to International locations? Many, but not all of our items are available for international shipping due to size and weight restrictions. International shipments are shipped via USPS Priority and take 6 - 10 for arrival after shipment. Shipping charges are shown under item price at top of listing for contiguous 48 states. Additional shipping charges usually apply to shipments to Alaska and Hawaii. You may contact us to see if it is less and we will give you an exact shipping quote. Sometimes we are able to assist in getting a product quicker than shown in the listing. If you need an item shipped ASAP for a gift, please notify us so we may give your order special attention. Send us a separate email immediately after purchase and we can see, but not guarantee, if there is away to get it to you quickly as possible. Do not send this information in the payment, we may miss it. Do you offer overnight or 2 day expedited shipping? In many cases we may be able to ship your order overnight or via 2 day expedited. Please contact us with your zipcode and we will let you know how much it would be. Do you offer returns on your items? If you receive an item which is not as described, we will promptly provide you a postage-paid return label and issue you a complete refund (including shipping). If you want to return your item for any other reason, you can return it for a refund (less shipping). To return an item simply contact us and provide the eBay item number and the reason for return. Returns requests are accepted up to 14 days after you received the item. What is a call tag and how does it work? A call tag is prepaid return label for those products that need to be returned due to our error or damage and is set up when a shipping carrier needs to pick up an item from your home or business, and deliver it back to our warehouse. Please attach label over the previous shipping label. Once processed, the carrier will make up to 3 attempts to pick up the package(s) from your home or business. You will receive a refund to your original method of payment, to your paypal account. I have a suggestion about your items or eBay shop! Please feel free to contact us anytime. We will take your ideas, complains and suggestions on how we can improve our store and service! We strive to always provide the best quality products & reliable friendly service to our valued customers. If for any reason you feel we have not earned your 5 stars in any category please ​give us a chance to rectify the problem and earn your 5 star feedback. We are always willing to do what we can to resolve any issue and will work hard to make you happy and earn your 5-star feedback rating!